Android 4.4 (API Level 19) introduces a new SYSTEM_UI_FLAG_IMMERSIVE flag forsetSystemUiVisibility() that lets your app go truly “full screen.” This flag, when combined with theSYSTEM_UI_FLAG_HIDE_NAVIGATION and SYSTEM_UI_FLAG_FULLSCREEN flags, hides the navigation and status bars and lets your app capture all touch events on the screen. When immersive full-screen mode is enabled, your activity continues to receive all touch events. The user can reveal the system bars with an inward swipe along the region where the system bars normally appear. This clears the SYSTEM_UI_FLAG_HIDE_NAVIGATION flag (and the SYSTEM_UI_FLAG_FULLSCREENflag, if applied) so the system bars become visible. This also triggers yourView.OnSystemUiVisibilityChangeListener, if set. However, if you’d like the system bars to automatically hide again after a few moments, you can instead use theSYSTEM_UI_FLAG_IMMERSIVE_STICKY flag. Note that the “sticky” version of the flag doesn’t trigger any listeners, as system bars temporarily shown in this mode are in a transient state. Figure 1. Immersive mode states. Non-immersive mode—This is how the app appears before it enters immersive mode. It is also how the app appears if you use the IMMERSIVE flag, and the user swipes to display the system bars, thereby clearing the SYSTEM_UI_FLAG_HIDE_NAVIGATION and SYSTEM_UI_FLAG_FULLSCREEN flags. Once these flags are cleared, the system bars reappear and remain visible. Note that it’s best practice to keep all UI controls in sync with the system bars, to minimize the number of states your screen can be in. This provides a more seamless user experience. So here all UI controls are displayed along with the status bars. Once the app enters immersive mode, the UI controls are hidden along with the system bars. To ensure that your UI visibility stays in sync with system bar visibility, make sure to provide an appropriate View.OnSystemUiVisibilityChangeListener to watch for changes, as described in Responding to UI Visibility Changes. Reminder bubble—The system displays a reminder bubble the first time users enter immersive mode in your app. The reminder bubble reminds users how to display the system bars. Note: If you want to force the reminder bubble to appear for testing purposes, you can do so by putting the app in immersive mode, turning off the screen with the power button, and then turning the screen back on again within 5 seconds. 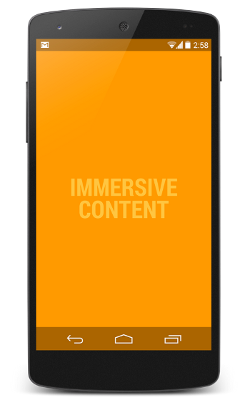 Immersive mode—This is the app in immersive mode, with the system bars and other UI controls hidden. You can achieve this state with eitherIMMERSIVE or IMMERSIVE_STICKY. Sticky flag—This is the UI you see if you use the IMMERSIVE_STICKY flag, and the user swipes to display the system bars. Semi-transparent bars temporarily appear and then hide again. The act of swiping doesn’t clear any flags, nor does it trigger your system UI visibility change listeners, because the transient appearance of the system bars isn’t considered a UI visibility change. Note: Remember that the “immersive” flags only take effect if you use them in conjunction with SYSTEM_UI_FLAG_HIDE_NAVIGATION,SYSTEM_UI_FLAG_FULLSCREEN, or both. You can just use one or the other, but it’s common to hide both the status and the navigation bar when you’re implementing “full immersion” mode. If you’re building a book reader, news reader, or a magazine, use the IMMERSIVE flag in conjunction with SYSTEM_UI_FLAG_FULLSCREEN andSYSTEM_UI_FLAG_HIDE_NAVIGATION. Because users may want to access the action bar and other UI controls somewhat frequently, but not be bothered with any UI elements while flipping through content, IMMERSIVE is a good option for this use case. If you’re building a truly immersive app, where you expect users to interact near the edges of the screen and you don’t expect them to need frequent access to the system UI, use the IMMERSIVE_STICKY flag in conjunction with SYSTEM_UI_FLAG_FULLSCREEN and SYSTEM_UI_FLAG_HIDE_NAVIGATION. For example, this approach might be suitable for a game or a drawing app. If you’re building a video player or some other app that requires minimal user interaction, you can probably get by with the lean back approach, available since Android 4.0 (API Level 14). For this type of app, simply using SYSTEM_UI_FLAG_FULLSCREEN and SYSTEM_UI_FLAG_HIDE_NAVIGATIONshould be sufficient. Don’t use the “immersive” flags in this case. When you use the SYSTEM_UI_FLAG_IMMERSIVE flag, it hides the system bars based on what other UI flags you have set (SYSTEM_UI_FLAG_HIDE_NAVIGATION, SYSTEM_UI_FLAG_FULLSCREEN, or both). When the user swipes inward in a system bars region, the system bars reappear and remain visible. // This snippet hides the system bars. // Set the IMMERSIVE flag. // doesn't resize when the system bars hide and show. Register a listener so that your app can get notified of system UI visibility changes, as described in Responding to UI Visibility Changes. Implement onWindowFocusChanged(). If you gain window focus, you may want to re-hide the system bars. If you lose window focus, for example due to a dialog or pop up menu showing above your app, you’ll probably want to cancel any pending “hide” operations you previously scheduled withHandler.postDelayed() or something similar. Implement a GestureDetector that detects onSingleTapUp(MotionEvent), to allow users to manually toggle the visibility of the system bars by touching your content. Simple click listeners aren’t the best solution for this because they get triggered even if the user drags a finger across the screen (assuming the click target takes up the whole screen). For more discussion of these topics, watch the video DevBytes: Android 4.4 Immersive Mode. When you use the SYSTEM_UI_FLAG_IMMERSIVE_STICKY flag, an inward swipe in the system bars areas causes the bars to temporarily appear in a semi-transparent state, but no flags are cleared, and your system UI visibility change listeners are not triggered. The bars automatically hide again after a short delay, or if the user interacts with the middle of the screen. Figure 2 shows the semi-transparent system bars that briefly appear and then hide again when you use the IMMERSIVE_STICKY flag. Figure 2. Auto-hiding system bars. Note: If you like the auto-hiding behavior of IMMERSIVE_STICKY but need to show your own UI controls as well, just use IMMERSIVE combined withHandler.postDelayed() or something similar to re-enter immersive mode after a few seconds.